Oh my apple pie! The Great British Bake Off is back on our TV!!! What better sight than a row of freshly baked pies? Oops... perhaps got a little carried away there! But anyway, unless you have been hiding under a rock for the past few weeks, you'll have no doubt heard that the Great British Bake Off kicks off at 8pm on Wednesday 5th August and we can't wait to get the party started! We of course have fond memories of the last two series (when we properly started getting into it). No doubt you can all remember Frances Quinn's amazing baking designs and fabulous picnic pie in the 2013 final (see link below if not or if you just want a reminder!) And of course last year we had the wonderful Kate Henry being awarded star baker in Pie Week - and we hope to try her pies in the coming months ahead! But one thing many of you may remember from last year, away from the main Wednesday night show, was how we aboard the Pierate Ship got involved in the Bake Off - and Pie Week in particular! Not only did we have a steak pie-off between Paul and Mary that has had a whopping 1,600 views already but we also then got invited to star on Great British Bake Off: An Extra Slice! Yes - those two odd people who cooked an exotic pie for Michel Roux Jnr to rate (we cooked a genuine crocodile pie, for goodness sake!!!) were in fact none other than Pierateer Rob (who has since been on BBC One's Rip Off Britain as a pie expert) and the Ship's Cook - who is about to reveal to the world how Mary and Paul's pies rate in her latest GBBO pie-off to see who will be crowned Star Baker in 2015! Bring on the pies!!! Excellent news for all you cake, bread, biscuit, pastry and especially pie fans - The Great British Bake Off is back! The adverts have been counting down the days and I just couldn't resist any longer... I had to get into the kitchen and bake some pies. You might remember that last year I pitted Paul Hollywood against Mary Berry by rating their steak pie recipes. Well it's time for a rematch and this time I've been testing their apple pie recipes. Mary Berry's Proper Apple Pie is a classic recipe - just apples, sugar and shortcrust pastry (you can find it here). Paul Hollywood, however, takes a more regional approach with a mix of apples and the surprising addition of cheese in his Yorkshire Apple and Wensleydale Pie (which you can find here). So, which of the Bake Off judges did I crown Star Baker? Read on to find out! Both pies were a beautiful golden brown and looked really appetising, although Paul's pies had some extra crispy patches from where the cheese had leaked out which I think just gives him the edge in this category. Mary's pie was my favourite in this category, with a lovely jammy apple sauce alongside the chunks of apple. Paul's pies had a nice creamy texture from the cheese and certainly weren't dry, but they didn't have the same sauce-like quality as Mary's. 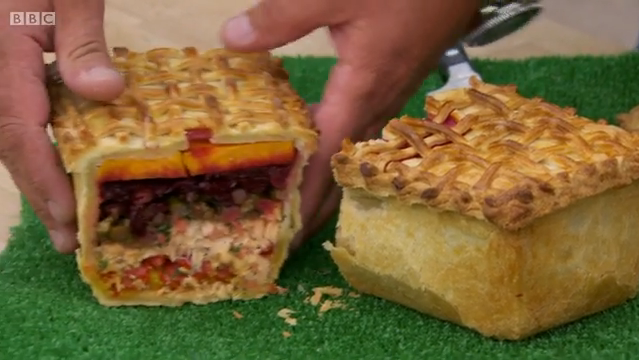 Both scored pretty highly in this category with plenty of filling, although if you make Paul's pies be sure to pack the slices of apple really firmly into the crust, otherwise when they cook down you get a bit of an air gap under the lid. Paul and Mary have slightly different ways of cooking the apple in their pies, but in both versions you end up with soft, mushy apple with just a little bit of bite left. The cheese in Paul's pies was soft and melted which added a nice creamy texture alongside the apple. These are both really cheap pies - some cooking apples and sugar won't cost you very much. Technically Mary wins in this category because you don't have to buy any Wensleydale, but the cheese isn't exactly going to cost a fortune! Both pie fillings are delicious. Apples and sugar, great. Apples and cheese, also great. Paul just sneaks ahead with the novelty value of added cheese though. I made mini pies rather than large ones because even I can't eat two giant pies in one sitting, and they looked lovely - golden brown, the perfect round pie shape and the filling stayed put when I cut them in half. I think it's safe to assume that the full sized versions would work just as well. So here's the thing - Paul's apple and cheese pies are seriously delicious. I could not stop eating them. They're sweet and salty and melty and just really really good. However...if I'm having apple pie for pudding I want to put ice cream or custard on it, or even ice cream AND custard. I cannot do that if you've put cheese in my pie (well, I could, but it would be terrible). So if this was just a pie Bake Off then Paul would win hands down, because cheese and pastry makes the best combination. But unfortunately for Paul this is an apple pie Bake Off, so Mary's lovely traditional pies are going to be smothered in custard and she will be pronounced Star Baker!